There are several different types of glaucoma. The most common types include open angle glaucoma, normal tension glaucoma and angle closure glaucoma. Other types of glaucoma can be induced by trauma, use of corticosteroids, due to exfoliation of the iris inside the eye, or congenital glaucoma. According to The Glaucoma Foundation, Open Angle Glaucoma is the most common form of glaucoma in America and occurs mainly in adults over 50 years of age. There are no symptoms associated with this type of glaucoma during the early stages of the disease. The intraocular pressure inside the eye slowly rises putting pressure on the optic nerve. This increase in pressure over time will permanently damage the optic nerve and cause irreversible vision loss. This process is painless and the patient does not realize he or she is slowly losing vision until the later stages of the disease. If high intraocular pressures are caught in the early stages of the disease, it can be treated with eye drops to reduce the pressure and prevent permanent vision loss. There may be a hereditary component to open angle glaucoma, and if you have a family history of glaucoma then you should be monitored closely with yearly eye exams. Since this disease affects one percent of all Americans, it is recommended that everyone have yearly eye exams to detect glaucoma before any visual damage occurs. 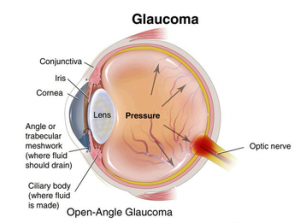 Another form of glaucoma that may account for about one-third of the cases of open angle glaucoma is called Normal Tension or Low Tension Glaucoma. Instead of having higher than normal intraocular pressures, the patient presents with pressures in the normal range of 10-22 mmHg. Even though the intraocular pressure is in the normal range, there is optic nerve damage. Therefore, patients must maintain a pressure lower than normal to prevent vision loss. This is often done with the use of prescription eye drops. Again, this is a painless disease and patients do not experience symptoms until there is permanent vision loss, so it is important to have yearly eye exams to detect any changes in the optic nerve. Angle Closure Glaucoma affects almost half a million Americans and is most common in people who are far-sighted or are of Asian descent. Those patients with a tendency for angle closure glaucoma will have a smaller than average anterior chamber, the space between the cornea and the iris, and a narrower angle between the trabecular meshwork and the iris for the fluid to drain. Narrow angles are observed during a general eye exam and through a test called a gonioscopy. If the doctor believes the patient is at a high risk for angle closure, then he or she may perform a laser procedure on the patient to place a small opening in the iris for fluid to flow more freely. This procedure is usually performed as a prophylactic measure in case the angle becomes closed off suddenly. During an Acute Glaucoma attack, the patient will experience nausea, vomiting, intense brow ache/pain, and/or blurred vision. An acute attack is an emergency condition and treatment should not be delayed as permanent damage can occur to the structures of the eye, causing permanent vision loss and/or chronic glaucoma. Many of these attacks occur when the patient is in a dark room and the pupil dilates to allow more light into the eye, so as the pupil dilates the angle narrows even further and triggers an attack. This can also occur during times of anxiety and stress, and with the use of drugs or certain medications such as anti-depressants, cold medications, antihistamines, and anti-nausea medications. Patients with narrow angles are informed of these symptoms, so they can seek immediate treatment in case of an attack. You can read about other Types of Glaucoma at The Glaucoma Foundation website. If you have been diagnosed with glaucoma or have family history of glaucoma, we recommend scheduling an exam with one of our Glaucoma Specialists, Dr. Sara O’Connell or Dr. Johann Ohly. As always, the best treatment for any disease is prevention, so make sure you have a yearly eye exam. You may request an appointment through our website or call us at 913-341-3100.